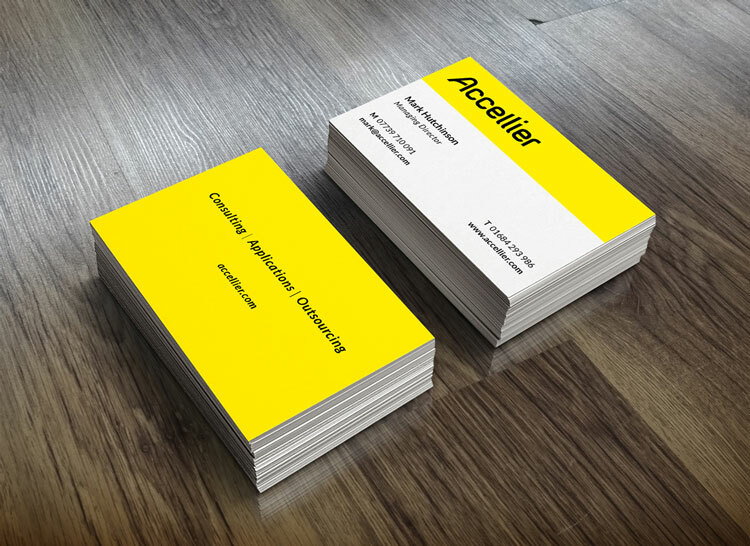 Accellier (formerly Aneako Interactive) are an established consulting business who provide businesses with better business processes. 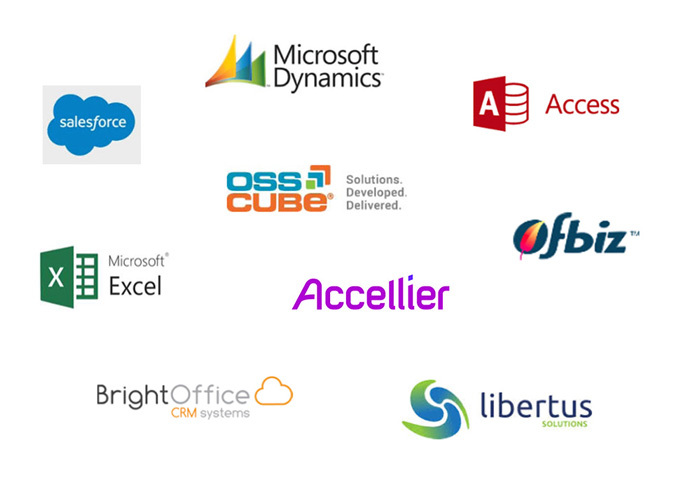 They help clients increase sales through improvements in Productivity, Compliance, Collaboration, Customer Satisfaction & Cost Reduction using Open Source software and offshore resources. The owner initially approached Designbull to redesign the website UI. He sent over a detailed brief that included his analysis and research. From our initial Roadmapping session it was agreed to update the ‘Aneako Interactive’ name, and create a new logo identity. But first, we needed to dive deeper into their company ethos and clarify their brand strategy and positioning. This would make it easier and more cost effective to redesign their website. 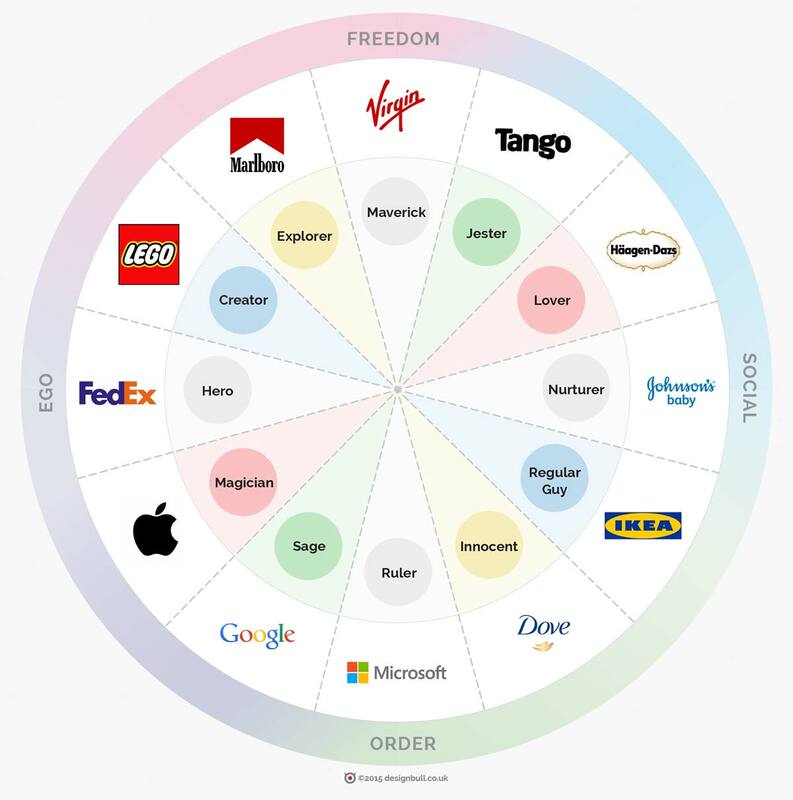 The 12 Brand Archetypes and example brands. Through stories, we relate our basic human motivations, our experiences, values and traits. Our brains are hard-wired to remember stories and not mundane facts or bullet points. It’s not about putting messages and images into people’s minds but connecting with what is already there. Brand Archetypes help to define an organisation’s strengths, their values and beliefs to clarify their brand and identity. What is your Brand Challenge and your Brand Vision? What are the Functional and Emotional Benefits? What is the Reason to Believe in your business? What is the Tone and Feel you put out? What are your Customers Desires/Needs Before and After? 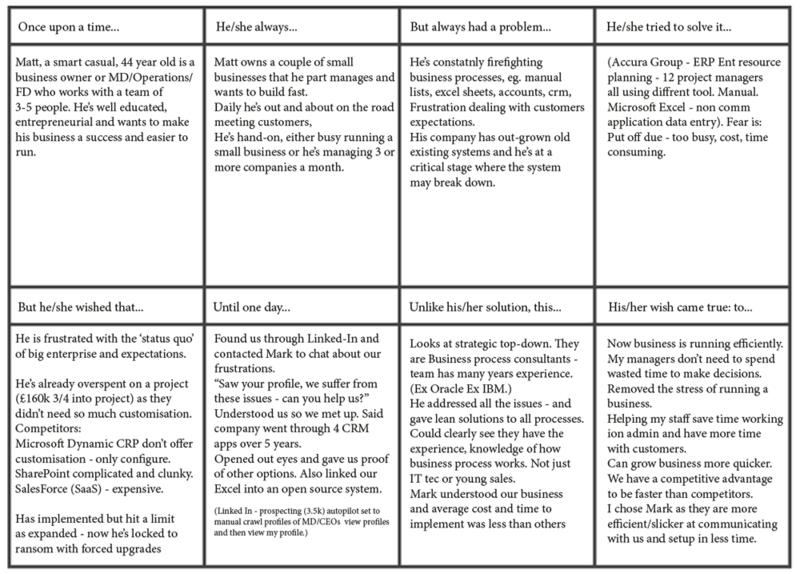 Brand Strategy Diagram based on the Brand Archetypes. Once we understood the company’s Brand Strategy, the next step in the process of rebranding was to understand the ideal customer by creating a ‘day in the life’ story of how they interact with the business. A strong brand story helps a company convey the type of value that they are adding for their clients. The Brand Storyboard exercise is made up by every single touchpoint of a user’s experience of your business – like a Customer Journey. Below shows the notes of the session as we developed a Brand Story for the fictional prospect, ‘Matt’. 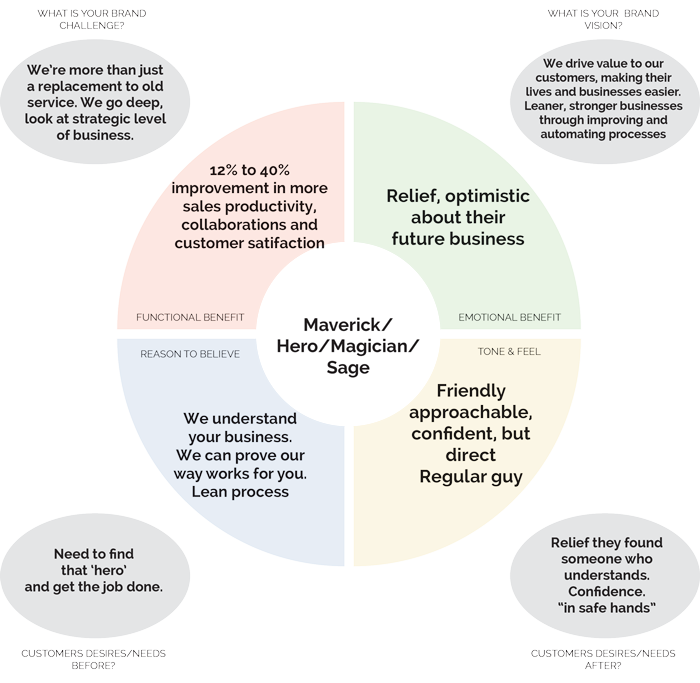 From our Brand Story we can now understand the ideal customer and their story. 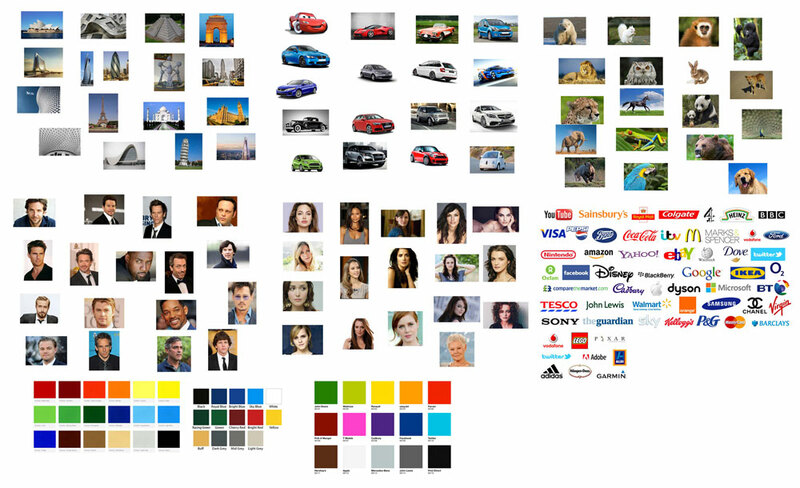 We can distill this information to create a client avatar or a brand persona. This is a great way of keeping the team familiar and focused. It includes just enough info about a company’s ideal client to bring them to life, but not too much that it prohibits it evolving and changing over time. 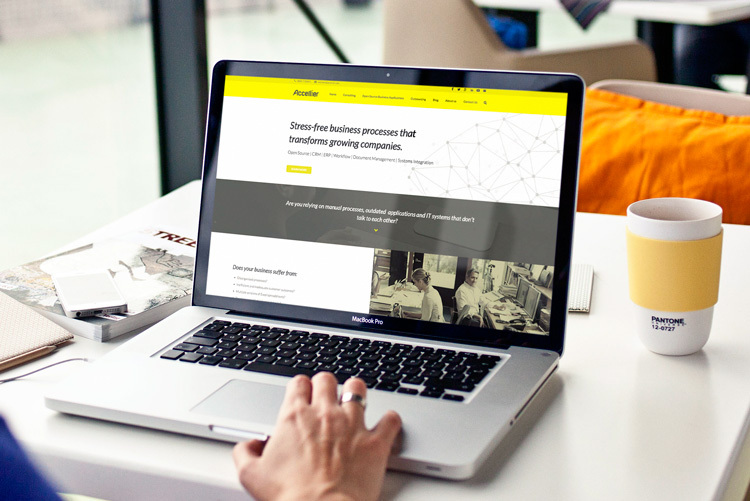 After discovering Anaeko’s Brand Archetype, defining their Brand Positioning, and creating their Brand Story and Client Avatar, we were armed with all the information we needed to make a start on discovering their new brand name. The first step was to identify the Brand Personality of their company. We printed and cut out different images of actors, cars, colours and logos and the client selected which ones he felt fitted his brand – and which one didn’t. We wanted them to think of their brand as a person, an object or an element and consider how would they describe them if it were walking down the street in the flesh. We then placed the cutouts all up onto our board and put notes around them all on reasons they were chosen. 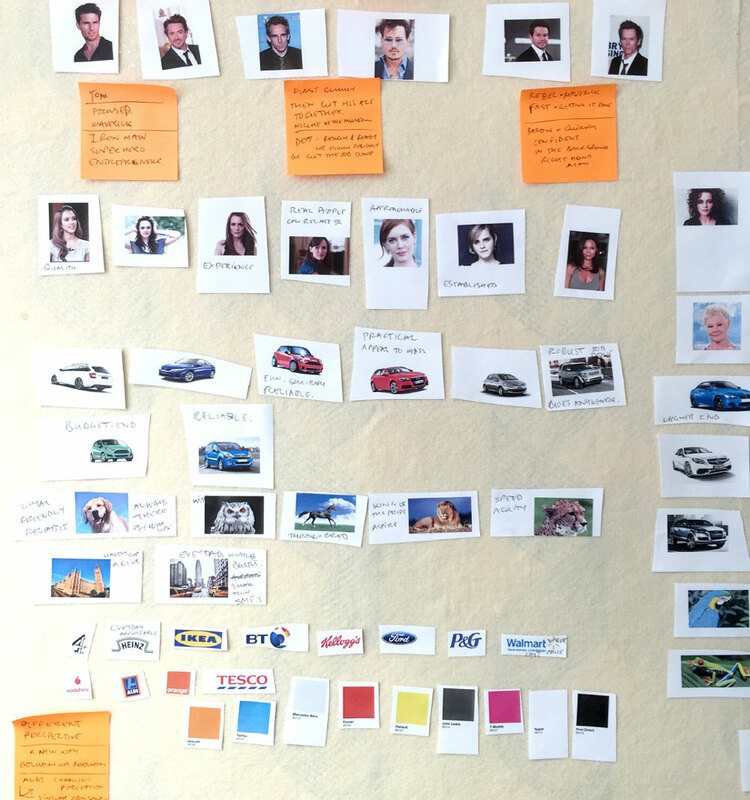 photo of our Brand Personality board as we worked through the session. 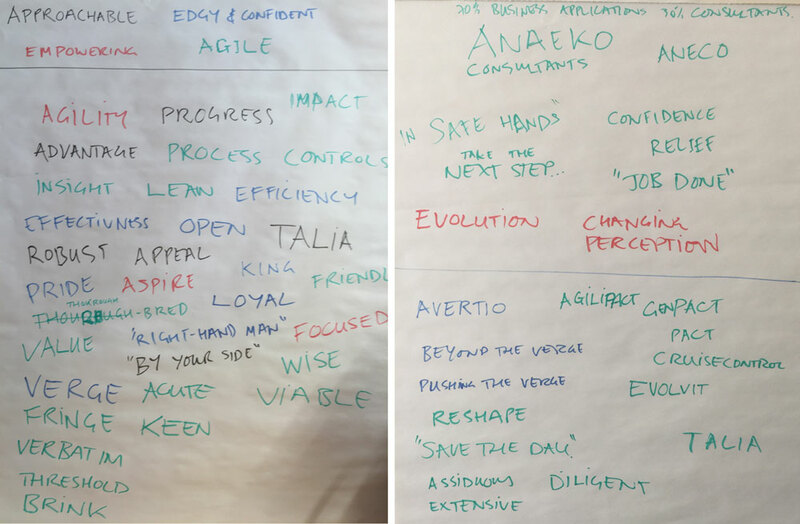 From these exercises, we discovered four clear themes that defined who they are, Approachable, Edgy & Confident, Empowering, and Agile. We then took these themes to the next step and started on names. Next we needed to think about the market in which Anaeko Interactive competed in and consider the name and the brand identity of their competitors. A company’s brand name should standout over the competition and make sure it doesn’t follow the industry herd. 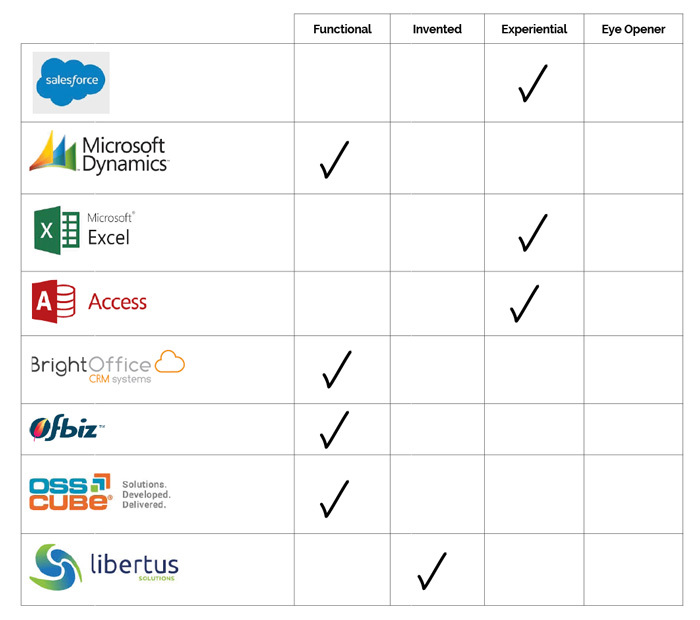 Functional – names which describe what the product is or does. Functional names tend to be the most common and least differentiated (e.g. Whole Foods, Public Storage, OfficeMax). Invented or Synthetic – names which have no semantic meaning (e.g. Skype, Häagen-Dazs). Experiential – names which describe the product experience (e.g. Highfive, Zendesk, Achieve Breakthrough). Eye Opener – names which are provocative and create cognitive dissonance when associated with a particular category, product, or service (e.g. Virgin, Starbucks). With all the information regarding Anaeko Interactive’s Brand Archetypes and Brand Personality, we undertook a naming session to try and establish their name. 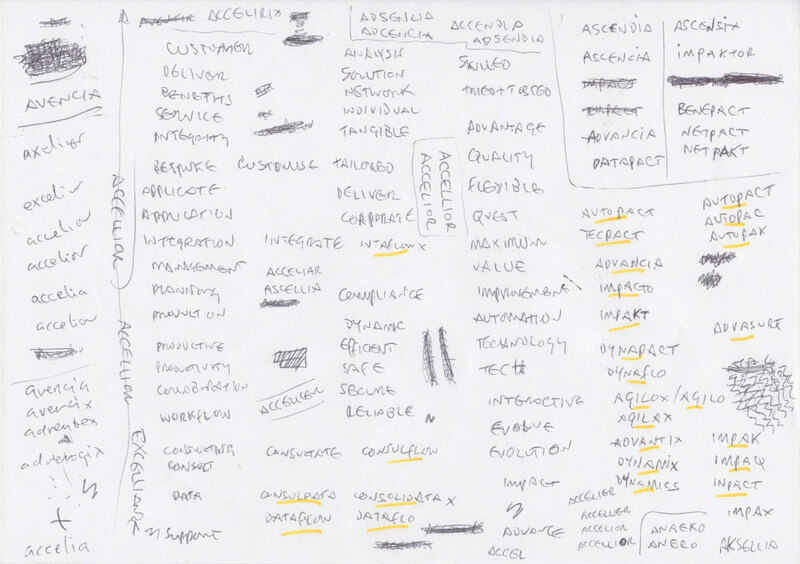 We decided that the best way forward was to create an invented or synthetic name, combining words which sounded like they related to various positive attributes of the company. The benefit of creating words in this manner means that they are unique, contain no negative connotations, and are free of any potential trademark conflicts. It also meant that we were able to quickly check potential .com domain names online to ensure that they weren’t already taken. The start of the ideas process in naming the brand showing just one of many notes and name ideas we worked through. 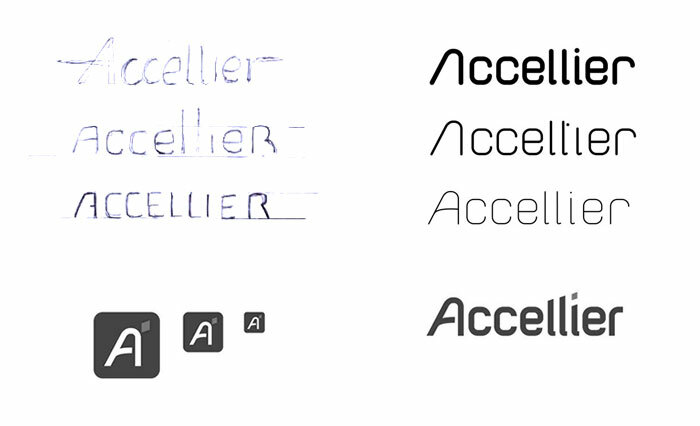 We narrowed down our name ideas and the final synthesised name combination was inspired by the positive and dynamic words ‘Accelerate’ and ‘EXCEL’ (from the Microsoft application that their prospects used). The final logo was agreed and guidelines, stationery templates and website design were created. “Through his Strategy and Roadmapping sessions, Designbull helped to define my positioning, come up with our new brand name and logo design – along with an updated, user-friendly website. This entry was posted in Branding and tagged brand naming, brand strategy, logo design, responsive web design, Roadmapping.